We left Boulogne on Thursday at 07:00 in the morning. 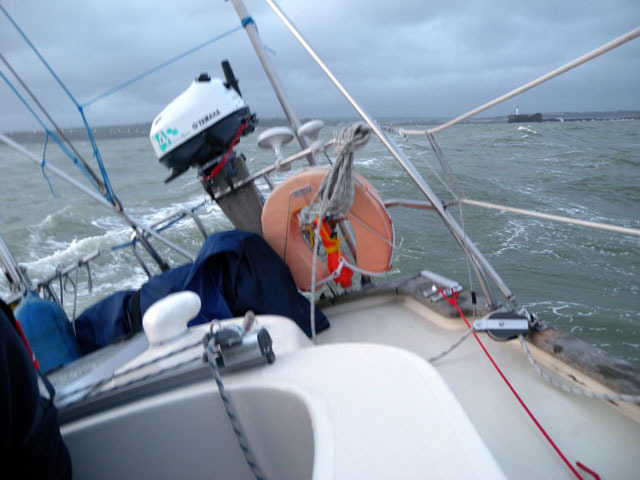 It was still blowing with 6-7 Bft and the sea state was quite rough. We had the second reef in the main and the headsail half rolled away. After 8 hours trying to make way west (we only managed to do 16 miles in 8 hours), we decided to start the engine. 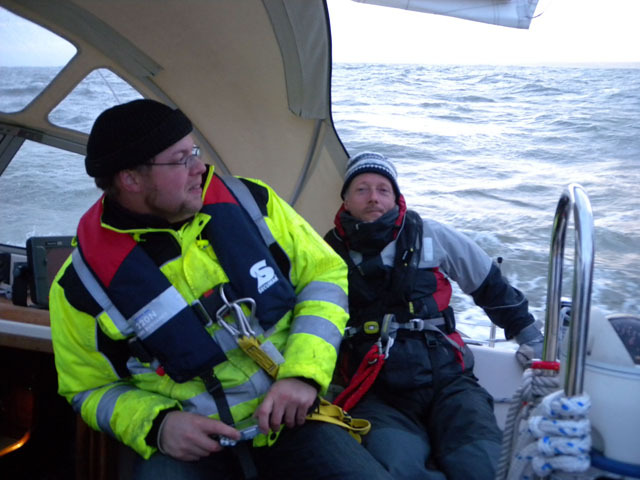 A few hours later the wind died away completely and the sea calmed down which was a great relief for one of the crewmembers who was suffering from severe seasickness. We arrived in Cherbourg Friday in the morning just before the turn of the tide after 24 hours of motoring. Another day in the harbour… Gale warning is still valid. 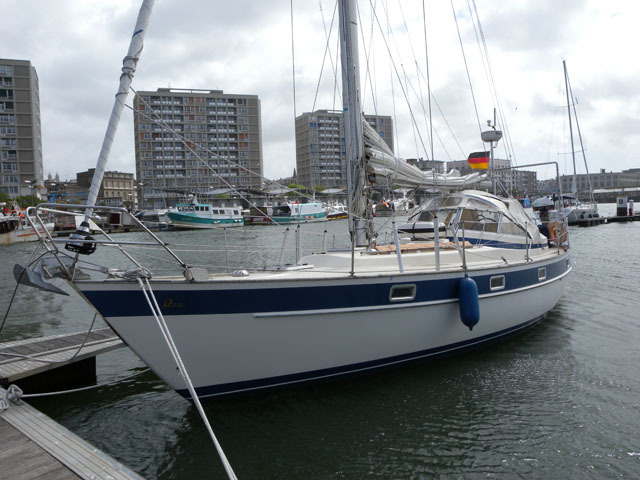 We will leave Boulogne Sur Meer later today and try to arrive in Cherbourg by Friday evening. The wind is expected to decrease but will still be coming from the wrong direction. There is another low expected for Saturday with strong winds and gusts up to 9 or 10 Bft. Next blog entry won’t be before Saturday. It’s quite windy today even in the harbor with strong gusts; gale warnings still going on for the eastern English Channel. We will enjoy the day in Boulogne and have a good rest. There have been many gale warnings for the area over the past 24 hours but the “Severe Gale Warning of Force 9” for the Dover Strait issued by the Dover Coastguard finally changed our plans and we decided to search shelter in Boulogne Sur Meer. We arrived at 22:00 in a downpour and made fast in the marina. We will probably stay in for the coming 24 hours. For some reason I have not realized yet that I am on my voyage to Greece. It still feels like a week’s trip with friends in northern Europe…. French Customs seem to like the boat. This is the second time I sailed to France and the second time I was checked. It was a cold and wet start, feeling like winter sailing. We arrived in Oostende yesterday late afternoon where the fourth crew member signed on. 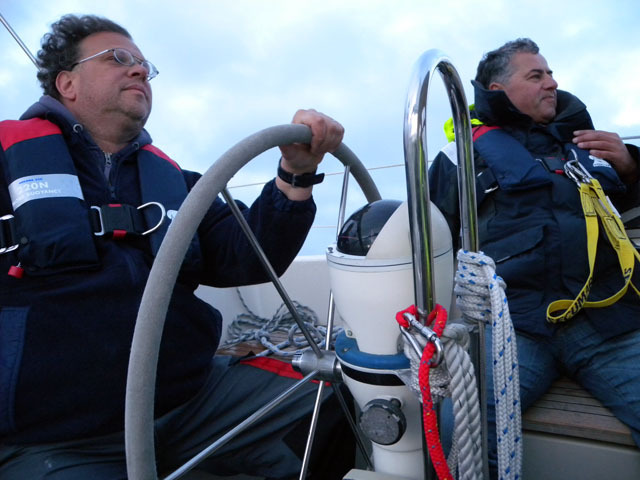 Despite the strong wind warning, we decided to go out and make some more way west to Nieuwpoort and ended up motoring against big waves for 4 hours. There is not much room at the Belgian coast for beating to windward because of the many sandbanks. A low west of Portugal is moving over England providing mainly strong west winds for the next days. Not what we want. 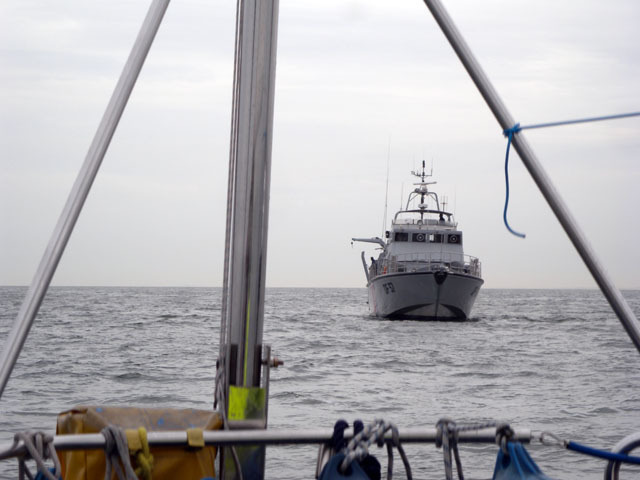 We will try to keep at the continental side of the channel for the time being. If everything comes out as we think, we will be in Cherbourg Wednesday afternoon. After 35 years of dreaming, after many years of looking for the right boat, after a year of planning, preparations and upgrades, the time has come. On May the 3rd 2015 in the morning at 06:00 I will follow the “call of the running tide” and set sail. I will leave the Oosterschelde and sail into the North Sea to Belgium and across the English south coast, I will cross the English Channel to France, then cross the Bay of Biscay, I will round Cap Finistère and sail along the Portuguese coast all the way south to Spain and Gibraltar and into the Mediterranean. 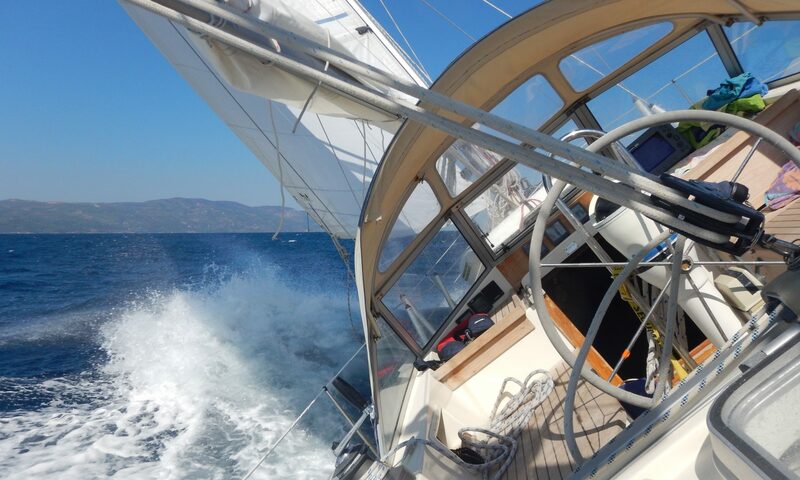 I will sail to the Baleares, to Sardinia and Sicily, I will drop anchor at Odysseus home island Ithaca and finally round Cap Sounion with its ancient temple of Poseidon and head north to Oropos where I will drop the anchor in the bay where I learned to sail when I was a child.